I’m not much of a fan of the self-help genre and I believe that most self-help books do little for their readers other than inducing a greater sense of self-loathing and diminished self-worth when those readers fail to convert themselves into better people overnight. How many copies of ‘How to Win Friends and Influence People’ are sitting on the shelves of friendless and uninfluential people who can’t quite remember how they ever thought something they paid a few quid for was going to change their personality overnight? I try to avoid getting sucked in – well obviously when you’re perfect already there’s not much need – but even I am prone to the odd purchase. I have more shelf-space than I care to measure devoted to various tomes on mind mapping and ‘de-junking’ my life whilst my mind remains largely terra incognita and my life is absolutely full of junk. Last year I took on the challenge of reading and reviewing a book called ‘The Optimist’ in which the author went searching for the secret of positivity and just made himself look like a bit of a loser so when I was offered the chance to read and review Oliver Burkeman’s ‘Help – How to Become Slightly Happier and Get a Bit More Done’ I was attracted to the relatively modest scope of the book’s claims. Nobody was telling me that this book would change my life so I thought I’d give it a go. 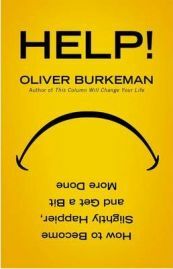 If you love self-help books then Oliver Burkeman might just help you to save yourself a lot of time and money because part of what he presents in his book is an overview of some of the trends and movements in the self-help arena in the 20th and early 21st century. You don’t need to read all those books – Oliver’s done it for you and he’s helpfully given his assessment of what works, what doesn’t and what’s worth bothering to have a go at. He also tells us what he’s tried that he believes in. I’ll save you searching for the secret of greater productivity – it all comes down to kitchen timers but in the interests of not spoiling his earning power (or making him less happy) I won’t spill the beans on his secret. The contents list is a helpful one if you want to tackle a particular area of your life though probably a holistic approach would be more valuable in the long run. There, did you see how I slipped into ‘upselling’ you a whole series of books on improving every aspect of your life? Well don’t worry Burkeman’s one of the good guys. He won’t do that to you. Instead we get ten simple chapters and a total of 275 pages in pursuit of slight improvement. We start with a short tour of self-help clichés, then move on to a chapter each on happiness and social life before heading to the office to look at work life and productivity. Mental life and everyday life follow before he shows us the charlatans of the Guru world and then takes us on what he calls ‘unlikely paths to happiness’. The final chapter is about reading lists and sources for more information. In many instances Burkeman also offers links to blogs and websites where you can mine the zeitgeist of self-help thinking without paying a penny. No trees will be harmed in your pursuit for self-improvement if you use the online approach. Most self help gurus have a basically fairly sensible idea and then do their utmost to stretch it out into enough words and pages to justify a book. The core of what matters in most books that promise to change your life can often be stuck on the back of a Post-it note but that wouldn’t earn the authors any money. There’s a very funny section in which Burkeman challenges the ‘stretching’ of the Chicken Soup for the Soul idea. After seeing ‘Chicken Soup for the Chocolate Lover’s Soul’ (the book with a chocolate bar attached) and ‘Chicken Soup for the Wine Lover’s Soul (with a corkscrew attached to the book) he wonders how long will it be until there’s a ‘Chicken Soup for the Chicken Soup-lover’s Soul’? We are introduced to some ideas that require mental gymnastics. For example statistically you probably have fewer friends than your friends do. It’s counter intuitive but statistically provable that most of us are probably losers when it comes down to it. He also explains how everything will always take longer than we expect it to and how we’re therefore doomed to reach the end of almost every day disappointed in what we’ve achieved. I certainly recognised that one! Did you know that bank robberies would be significantly cut if the assistants behind the counters actually smiled at their clients – especially those who are potential robbers? Apparently it’s hard to scream ‘Stick ‘em up and put the money in the bag’ if you’ve made eye contact with your intended victim. So smile and whilst the world won’t necessarily smile with you, the mugger might think twice. The back cover highlights some of the key contents that might just lure you into buying a copy. These include insights into ‘The Hidden Pleasures of Worry’ (I know so many people who are lost without something to worry about), ‘How to be Interesting’ (basically let other people talk about themselves), ‘Why meetings should be abolished’ (hoorah, I’ll second that one), ‘How to empty your inbox’ (basically anything more than a couple of weeks old is unlikely to ever surface again) and something that most of us will recognise ‘Why Sunday is the most depressing day of the week’. All this and much more can be found inside ‘Help!’ and the good news is that most of it is delivered in such a pragmatic and practical style that you might actually just possibly maybe with a good following wind DO some of the things it suggests. Personally I’d suggest that next time I think of ‘De-junking’ my life, I’ll start with the self-help books on de-junking my life, buy a big bar of chocolate, light a nice fire and curl up to read ‘Help!’ another time or two. Burkeman is a journalist who writes for the Guardian but he can spell so obviously he’s not too typical of his type or maybe he has a nice sub-editor who can spell. I’m not sure but either way his weekly column called ‘This Column Will Change Your Life’ looks like it would be well worth a read or if you can’t bring yourself to muddy your fingers with all that smudgy ink, you can read some of his musings on his website – www.oliverburkeman.com. If you aren’t sure that his style will suit and you want to road-test him before parting with your hard earned Amazon vouchers, give him a little read and see what you think. I suspect you’ll like him as much as I did.